thrift store find | i made it so. i’ve been known to meander my way into a thrift shop now and then. even though places like value village make me a little wheezy (and just what is that smell? ); even though about 98% of the things there are someone else’s treasure, but certainly not mine. but when my eyes fall on that little something, that thing that makes me do a double-take, pause, and ponder on where i will put it, if it’s worth sacrificing the space i have in my small home. i generally follow the rule of “something in, something out” when bringing something into the home, so what will have to leave to make room for this? or sometimes, i’ll see something, and start daydreaming about what it can become. that 2% is what keeps me going back. the thrill of the hunt. the possibility of what something could be, with a little creativity and tlc. and all for just pennies? 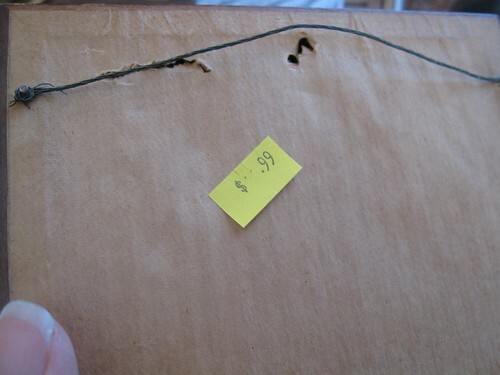 well… if you have been bitten by the thrifting bug, you know what i’m talking about! 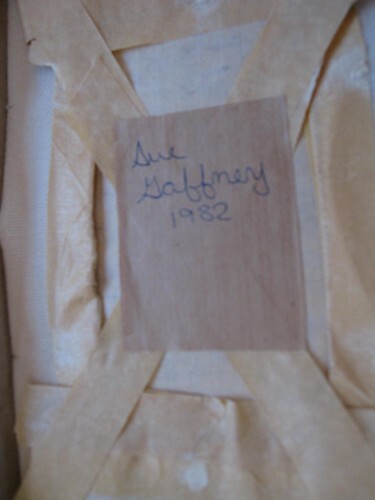 the cloth fabric was also stamped with MCMLXXX (1980). 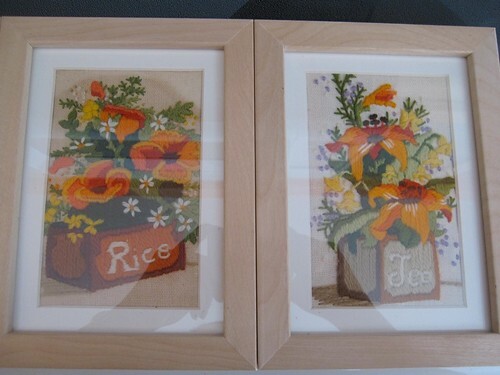 the fabric was thickly folded and taped so they had to be refolded to fit these natural wood frames. 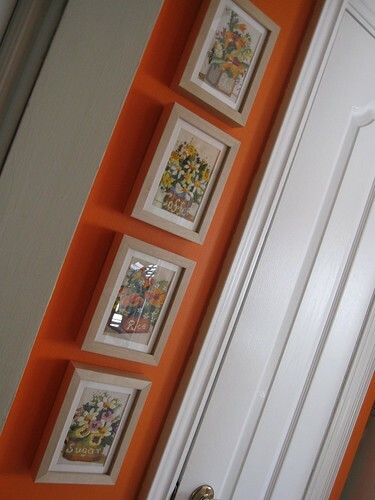 and here they are, right where i wanted to place them… next to the pantry. they brighten up my kitchen even more, if that was possible! 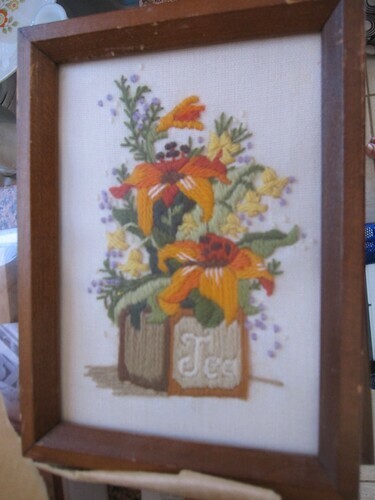 This entry was posted in around the house, in the kitchen, thrifting & vintage and tagged fibre arts, frame, kitchen, needlework, thrift. Bookmark the permalink. Pingback: a tisket, a tasket… | i made it so. Love these finds! they look adorable in your kitchen, I love the paint colour BTW! chelsey, that’s a cool idea, thank you! I love this idea Ana! Wow. Putting them behind glass adds so much. I’ll have to keep this in mind for future thrifting adventures. Those are AWESOME! And I love your orange!!!! Those are ADORABLE!! And I DO love your kitchen wall color!! Go ORANGE!!! Ana, they look so great on the orange painted wall and that white crisp door next to it! Thank you for visiting today :-) We must share the same sense of color/colour and dishes. I’ve been finding more and more Mikasa at the local thrifts with the lovely oranges! 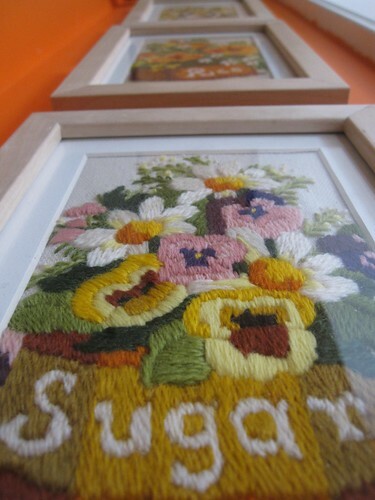 And browsing through some of your posts – what a lovely re-do of the crewel work pictures here. Freshened them up beautifully! Pingback: before & after: ensuite bathroom makeover | i made it so.